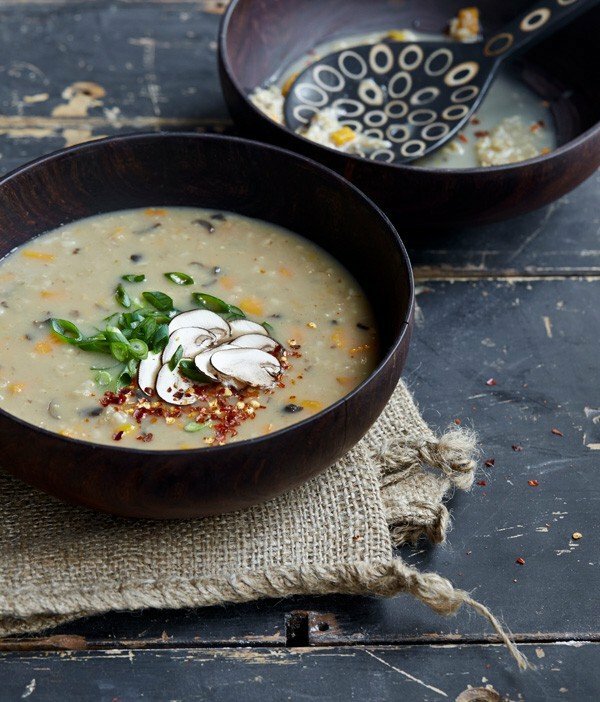 This recipe for Mushroom Ginger Steel-Cut Oat Congee comes from OATrageous Oatmeals. I bet you already guessed that, right? What’s congee? Traditionally it’s a thick stew made of rice that’s cooked with extra water to create a porridge. Oats do the same thing here and I think it adds a bit more texture. Served in a bowl, Congee is a thick Asian comfort food that can soothe a sore throat or just make you feel better after a bad day. This recipe makes enough for two but feel free to double or triple if you’re feeding more or want to keep some in the fridge for the duration of your cold. The mushrooms and ginger are great for getting your immune system back on track. Bring the broth, oats, mushrooms and minced carrot or sweet potato to a boil in a medium pot. Lower the heat to medium-low and add in the ginger, soy sauce and vinegar. Cook for 15 to 20 minutes until the oats are cooked and the stew becomes thick. I’d be most excited to win the measuring cups in the drawing. Mine are all worn out. Wow, Kathy, that congee looks great! When it cools off around here, I’m definitely trying that. Thanks, and congrats on the new book! I’m excited to try this soup. I’very never used oats in savory dishes. My measuring cups and spoons have seen better days. I’d love to win new ones. What great reviews! I am intrigued just by the congee recipe. I could really use some new measuring cups. I would love to win the book, too! I think the oddest thing I’ve made with oats was a mock meat. I can’t remember how it turned out or where I got the recipe. I eat oats just about every day for breakfast, though. I would love to win the measuring cups! My husband loves breakfast oatmeal with peanut butter and Hershey’s kisses stirred in. It’s more of a dessert, though! I like the measuring cups ! I would love an OXO whisk or measuring cups! I love kitchen gadgets! The craziest dish I’ve made with oats would be a meatless loaf. I like the measuring cups and spoons. I made oatmeal with oats. It was good though. I love oatmeal for breakfast but have also been known to add it to my smoothies. Never thought about adding it to savory dishes until I saw this cookbook. I love Oxo tools and just got their mandoline. It’s a tough choice but if I had to pick the one I like most of the ones shown here it would probably be the scoop because it’s so versatile. It could be used for ice cream, making cookies, vegan “meat”balls and burgers, and I’ve seen people use scoops to fill cupcake/muffin tins. My favorite OXO tool is my can opener, but these all look like fun! Just made veggie dogs tonight using oats — yum! I love my OXO peeler! I’ve made savory oats w/ an egg, sauteed spinach and onions. Are those little beaker-like measuring cups? Because I’d love those! My craziest oat dish? It only consists of part of the recipe, but I made a savory herb-infused gluten-free waffle using oats and buckwheat. Tasty! I use my OXO salad spinner all the time! I’ve been replacing all of my old tools withOXO as they die. I love my OXO nutmeg grater. My next purchase will be the OXO cherry pitter. Oxo vegetable peeler was my 1st piece so many years ago and still my favorite. Then my whisk, then my bowls. I am a oat fan and the congee looks amazing thank you for running this chance to win! I have the very large cutting board. I can chop everything on one board without having to dirty another dish, and it fits over my sink so if I’m running short on space I can still chop. My measuring spoons have all the numbers rubbed off of them and some are missing, it’d be great to get a new set! The craziest thing I’ve made with oats is an egg, veggie, spinach, and oat cake thing…..It was green! I love ALL of the OXO tools! I especially love the salad spinner. I do love OXO tools with the stiff hands I sometimes have. My fave gets the most use and that’s my bowl with a small handle to hold on to. It keeps it from flying across the room sometimes! Love them all though. My craziest dish was a potato topped with oats that looked a little odd and probably didn’t taste that great but I just love a good crunchy granola/oat topping. Maybe I’ll try oats and cheese topping on my potatoes next time! I love my OXO garlic press! I made sriracha oatmeal once. It was pretty good! I’ve always wanted a baker’s dusting wand…I think it would be simply magical! I could use a whisk! That tea strainer could really come in handy. 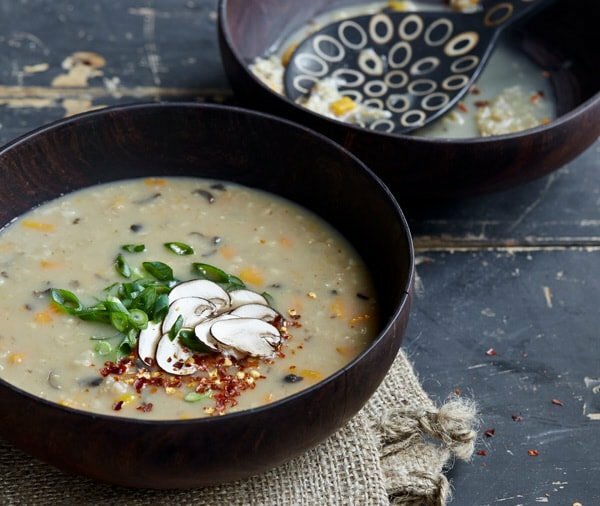 Thanks for posting this recipe; I have everything for mushroom congee at home–that made dinner planning super easy. I really really need new measuring cups and a garlic press – tools that I just don’t want to go out and buy but using the ones I have until I can’t anymore ha ha. Craziest dish I ever made with oats was adding them to my morning smoothie – adds a crazy filling quality and great texture. Not too crazy but different enough that you wouldn’t think of it as something to do normally. My fave OXO tool is the whisk (and I’m looking forward to winning another). First time I made an oatmeal face mask it seemed crazy (but it’s not). The measuring cups and spoons! The craziest dish with oatmeal…chocolate, peanut butter pudding! I can see I’m not taking full advantage of oats. I think I need your new book! What a lovely recipe. I’ve never had congee, but I can’t wait to try this! I like my OXO food scale, use it all the time! I just made a double batch! It’s heavenly! Added a little nooch and extra soy sauce for a beefy flavor boost. As for crazy oats uses, oh man, everything! Skin treatments for psoriasis. Milk. Desperate egg replacer. Pancakes, cakes, all manner of baking including countless loaves or veg burgers. I have crazier plans for oats that include a cheese recipe lol. Thanks for the great recipe post! I have been looking for a clear and concise English language congee recipe for more than a year! I’m confused by why the article talks about steel cut oats, but the actual recipe uses rolled oats. The two are very different. I’m not sure how that happened, but the recipe uses steel-cut oats and I’ve updated it.